A sermon preached at the Unitarian Universalist Fellowship of the Rapphannock on Sunday Dec. 30,2012. First my thanks to all of you for inviting me back again. It is always a joy and privilege to come and worship with you. You are such a warm and welcoming community. So here we are at the end of a year which of course marks the beginning of a new one. This time of year truly embodies Eliot’s words “to make an end is to make a beginning.” Lately our culture has been filled with news of “endings” with the supposed Mayan end of the world. As a culture there seems to be a lot of attention on “endings” – the end of a year, an era, a way of life. Some are angry and want a return to “the good old days” – a longing for a better, simpler time. Some focus simply on what is next – looking only head and cannot wait to put the past behind them – looking to create a better future. As Unitarian Universalists we have often been in the later category – focused on the future, less concerned with what has come before. We are in that way a thoroughly modern faith community. After all it was Ralph Waldo Emerson in his Divinity School Address that admonished the young ministers “..to go alone; to refuse the good models, even those which are sacred in the imagination of men,..” Emerson called for a direct experience of the holy, to trust one’s own self. This did not endear Emerson to those at Harvard who of course invested time and energy in training new ministers in the tried and true model of the old. Of course there is a downside to this future focused, figure it out for yourself approach which is that often we end up trying to re-invent the wheel or we continually repeat the same mistakes because we keep forgetting what did not work. As the poet and philosopher George Santayana reminds us: "Those who cannot remember the past are condemned to repeat it." Unitarian Universalists are also optimists. One of key tenets of liberal religion according to UU minister and theologian, James Luther Adams, is that “the resources (divine and human) that are available for the achievement of meaningful change justify an attitude of ultimate optimism.” Given our optimistic, future oriented faith, how do we approach this time of the year that seems to beckon us into a reflection not just on what is to come but also on what has been? How do we understand Eliot’s words that the end of all our exploring will be to find ourselves at the beginning? This excerpt from Eliot’s "Little Gidding," has long been a favorite of mine. There is a resonance that our exploring brings us back again and again…that time is not linear but rather a spiral. It is not a simple repetition of the past but rather to come back to the beginning and see it with new eyes, to see what we could not see before, the waterfall, the children in the apple tree, even the very gate through which we enter. We have been here before and yet we know it again for the first time. While Eliot gives us beautiful images of waterfalls and children, I know that in my life, sometimes finding myself in the same place can mean finding the same problems and pain. Ah yes, here we are again or maybe more accurately “Oh No not this AGAIN!” We wonder if we can ever break free if these patterns and making the same mistakes. Ah yes, to find ourselves at the beginning again does not always feel like such a good thing. So what do we do when we find ourselves in this place AGAIN? Maybe some of us are feeling just this way at the end of 2012 and we would like to just leave it behind and begin again in this coming new year. How might Eliot’s poem help us here? Well maybe we can begin with noticing what is different? What do I know now that I did not know before? Well I know I have been here before and somehow the path I took from here led me back. So bringing our awareness that we have been here before, we can look at what we have tried before that didn't seem to work very well. This is where I also look to Eliot’s call for hope, words that echo those of Julian of Norwich, a 14th century Christian mystic, “And all shall be well and all manner of things shall be well.” Even if we find ourselves in a mess again, faith calls us to trust and continue on, for all shall be well. All shall be well, all manner of thing shall be well - maybe it doesn't feel like it right now but can I, can we, hang onto that in the darkness? Can we trust as Adams tells us that there are enough resources, human and divine, to change things, to make a difference? As Unitarian Universalists, as people of liberal faith, we are called to be people of hope…people who believe that all shall be well. So we trust that this too shall pass, that we have the resources to address the problems, and while we may not see it now, we can work to make it better. For those longing for the past, angry about the state of the world (and they are not wrong, there is a lot to be angry about), there is a deep longing for what is missing. While some look forward, they look to the past, thinking if we just went back to the way things were, that things would change. How often have we engaged in this type of thinking? It can take on many different guises. There is the “If only I had done x instead of y” then I wouldn’t be here. There is blame, “If only so and so had been elected or not elected than we wouldn’t be here.” Yet here we are, having made the choices we made. It is a type of thinking that we can all engage in from time to time. How do we break free of this “what if” or “only if” thinking? I think it begins with the realization, that we cannot truly know whether a different choice would have been better or worse. We hope that as we gain maturity and wisdom our ability to make choices gets better. Certainly as we get older, we have more experience both in making choices and in the information we have to make choices. When I think about the struggles with depression that many of our youth and young adults experience, something I too experienced, I realize now that often youth and young adult s simply do not have enough life experience to know that things will change. That we can be assured of one thing, the wheel will turn again and things will change. So reminding ourselves, being gentle with ourselves, that maybe we did the best we could at the time and that the next time, and, for the most part, there will be a next time, we can make different choices, hopefully better ones. In my own life, I experienced this with moving. Back in 2000 my partner, Donna and I decided to buy our first house. Friends and family had been asking when we were finally going to buy. Mollie was about a year old and it seemed like the right next step. We ended up buying a house that we liked but not in a location we particularly liked. We were far away from the UU congregation we had joined, from my family and all that we had known. We lived our life in two places – our house in one place and work, family and faith community in another. We never truly settled into our new community. When in 2004 we moved to Berkeley, we made the very conscious decision to be fully where we were living. We joined a congregation in Berkeley, we built a life where we were living rather than having a house one place and our life in another. It was a rather painful, not to mention expensive lesson but we learned that the importance of both having our home where our life is and to create our life where our home is. In some ways this has been a recurring theme in my life…as someone who has wandered a bit in her life growing up in CA, college in Washington, DC, having lived in Maryland, different parts of the San Francisco Bay Area and now in Williamsburg, VA – I need to remember to create my life where I am living and not try to create a life in a place of the past or far away from where I am living. Ah yes, to arrive where I started and know the place for the first time and being able to make different and better choices. Another way of thinking about all of this is the image of the labyrinth. As you know from the labyrinth on your grounds, a labyrinth is a spiral or a circle and the path leads in, sometimes bringing you quite close to the center, while then leading you back to the edge. The path takes you in and out and around and will lead to the center and then the path takes you back to where you began. I know for myself each time I walk a labyrinth, no matter how many times I have walked a particular one, there is always something new to see, maybe some of you have had that experience here. One of my favorite labyrinth’s is the Jerusalem Mile labyrinth that looks out over the city of Richmond at the Richmond Hills Retreat Center. Every time I walk it I try to stop at each of the corners, look out over the city, and each time it is new, each time I see something different. Even the path itself feels different each time I walk it. What if we viewed time as more of a labyrinth rather than a line? What if we re-connected with the ancient wisdom of living in a cycle of seasons rather than the notion that life proceeds in a straight line with a beginning, a middle and an end? How might that change our celebrations this New Year’s Eve? 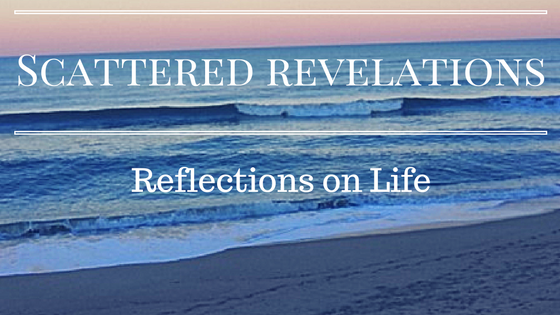 How might that change the way we reflect on our lives and our future? Seeing time as a spiral does not mean a rote repetition. It is a pattern with variation – much like the seasons. Some winters are colder; some summers have more rain and others less. While the pattern repeats, there is variation making each cycle through unique. So where is the journey taking you? Where is it taking us? Are we willing travelers or are we busy making plans, creating safeguards against danger? Or are we embracing the unknown and continuing our exploring? Are we taking a trip or are we letting the trip take us? And we do not have to do this alone. Who have we invited to take this journey of life with us? What communities are we a part of? What individuals – friends, family, spouses do we share our journey with? We can help each other through the rough spots. Who in your life could use the reminder “And all shall be well”? Who in your life can remind you? How are you as a faith community on a journey together? What have you learned? What are your hopes? I was reading your vision and plans for the future. The vision draws on what you have done and learned before – you did not leave it behind rather you have brought what you have learned forward. It is a vision that serves not just those of you here right now, but a vision that reaches out to those not yet here. At this threshold of the year, a time of one year ending and another beginning I invite us to see the year as a spiral rather than a line; the journey as the point itself rather than a race to a destination. We are once again at the beginning, we started on Jan. 1, 2012 and now we stand on precipice of Jan. 1, 2013. As we stand at the end, which is also the beginning, what have we learned? Are we longing for something from this past year or years past? What is at the root of that longing? Have we reached the end of a particular season of our life? Is it time to try something new? What do we notice about this place, this familiar place, for the first time? Are we saying “Oh No Not this AGAIN?”! Are we saying “Oh yes this Again!”? If not this again, what do we know now that can help us with the current situation? If Oh yes this again, can we stop, be still and take it in? So I invite you to take this moment, in many ways an arbitrary moment, of this changing of the calendar year, to reflect, and to know this year for the first time.